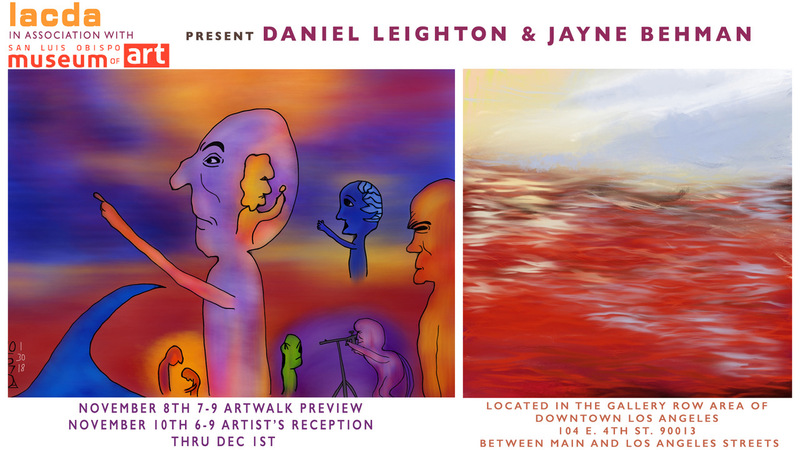 Los Angeles Center for Digital Art presents “Electric Abstractions” a traveling exhibition from the San Luis Obispo Museum of Art (SLOMA) featuring the works of Daniel Leighton and Jayne Behman. They are both California contemporary artists who use technology to create their work. Jayne Behman substituted her brick and mortar studio with her iPad years ago to be able to create anywhere, anytime; without borders. It is on the technology "canvas" that she processes her Marks. Using a combination of Apps her paintings reflect her vision of a world reacting to change.